Metal artifacts were delivered to the Dobrich Regional Historical Museum in the spring of 2016. The only information available about their provenance was that they had been found in the Kayryaka locality near the village of Odartsi, Dobrich region. During the survey carried out at the site, the archaeologists collected pottery sherds dated back the Late Iron, Hellenistic, Roman and Medieval periods as well as coins. The majority of the sherds and the metal artifacts are dated back to Early Medieval period. There is no information whether coins dated back to this period have been found previously at other sites. These artifacts suggest the functioning of another settlement dated back to the Early Medieval period near the Kaleto hill, where archaeological excavations were carried in 1971–1991. The area where the settlement is situated is flat. It is situated ca. 1.3 km to the southeast of the easternmost houses of the village of Odartsi and ca. 1 km to the east/northeast of the Kaleto hill and the Pecheneg cemetery at the foot of the hill. The thirteen metal artifacts discovered in the Kayryaka locality are very interesting. 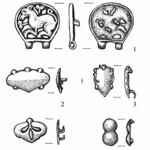 the following artifacts, all cast from bronze, have been identified: part of a twofold belt ornament, five belt mounts, two strap ends, a clasp for a book, a front half of a reliquary cross and part of a single pectoral cross, a ring and a small profiled artifact. The element attracting most of the attention is the intricate and unusual upper section of the twofold belt ornament. An animal figure manufactured in openwork is enclosed by a thin frame. It resembles a donkey rather than a horse. It is one more artifact to be added to the number of finds belonging to the Vrap–Erseke group, which is found and probably produced in present-day Bulgaria. Several sherds of gray-black burnished ware can be related to this group, the most notable of which is the neck of a jug with layered bands on the inside. The rest of the metal artifacts are typical for the 10th – first half of the 11th century. The metal objects and the collected pottery sherds under study strongly suggest the existence of a medieval settlement in the Kayryaka locality. Some of the presented artifacts are very similar to those found on the Kaleto hill. They illustrate that the settlement in the Kayryaka locality functioned in the 10th – the early 11th century, making it contemporary to the last period of the settlement on the Kaleto hill. the Kayryaka settlement was probably abandoned in 1030s. It is possible that the Pechenegs were the ones that chose to settle on this flat area, a suggestion supported by a fragment of a large cauldron.